And I want you to be honest with me. Brutally honest. 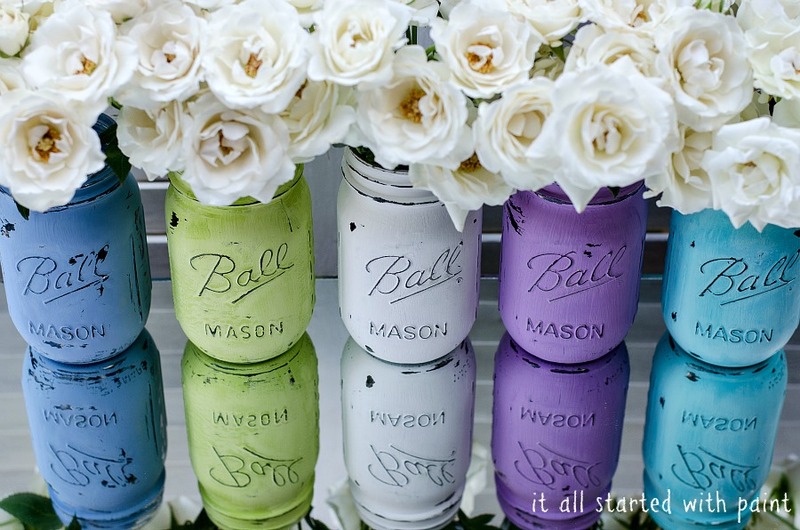 I automatically assume that since I can ~ and will ~ do something like paint and distress a mason jar, that everyone else can … and will. Because this is the juncture where I become confused … unsure. On my first try, I used a sanding block. I didn’t like the effect. It removed more paint than I wanted. So those mason jars got a second coat of acrylic. And a second overnight to dry. It enabled me to gain better control over paint removal. And reach small spaces. The final step: A coating of water-resistant, scratch-resistant enamel. This means they can be wiped down, but never, ever submerged in water … or run through the dishwasher. ***Update, I do offer this set of jars along with many other colors and styles at my Etsy shop now and they are selling out left and right!!! So thank you all for your wonderful words of encouragement!!! I just got my box of reproduction blue jars this week. *shhhh* I have a plan! Personally, I wold not buy them from your ETSY shop, but that’s because I would make them myself. But, there are people out there that will buy anything and many people that are not as crafty as we are. So, go for it!!! Give it a shot and see what happens. It might work. It might not, but the shop is there anyway, might as well use it. Not everyone has the time, desire or talent, and its much easier for them to buy from you! Sell away! And who says things cant be easy for you to make, doesnt make them anyless desireable! I also love that you seal them, never would have thought of that!!! I ask myself the same question regarding just about everything I do. I mean, if I can do it, can’t everyone else? I’m no help at all! I think you should totally sell them! They look so pretty! Love the colors and $24 for a set of six? Seriously? A great gift that’s super affordable! I totally think you should. Like others have said, there are lots of people who want to have beautiful, hand-crafted objects in their house but have no interest whatsoever in DIY. They don’t want to buy all that paint, they don’t like the mess, they don’t have the talent, they don’t have the time… the list goes on. I say Sell, sell, sell! I ditto Marian. Why would you even doubt yourself???? As your blog says “It All Started With Paint”. I doesn’t hurt to try. I have seen other people selling them on etsy, so you would think someone is buying them. And yours are much prettier colors, so would have a leg up on the other sellers. I love them and think they would sell to the “un-crafty”. I agree with Sally, you must be able to ship them without breakage and at a reasonable price. They look wonderful. The colors are amazing. The photography is impeccable. I agree with most others – I would make them myself, but there are plenty of people who don’t make things. But they buy things. You’ve got the shop. Give it a try! I love them. But I would just make my own. I also refinish nightstands, make drop cloth curtains, and am turn cupboard doors into chalkboards. A lot of people don’t put those things high on their fun list the way I do. I think you should lost some and see how it goes. There are plenty of people who aren’t crafty; I couldn’t make a decent skirt if my life depended on it. You never know, they might sell really well! They definitely say spring to me! In France, we would say “it doesn’t cost a dime to try!”. They are really cute. Since they are so easy to make I probably would not by them for 24 dollars. I might think about if if they were $16 or less for 4. And that is really only if I think the $4 a piece is worth the hour of time it would take me to create these when the supplies are so cheap. You are asking the wrong audience. Most of your readers would look at something you do and think, “I could do that except I would change it this way.” The etsy audience is different, so the only way to know is try. 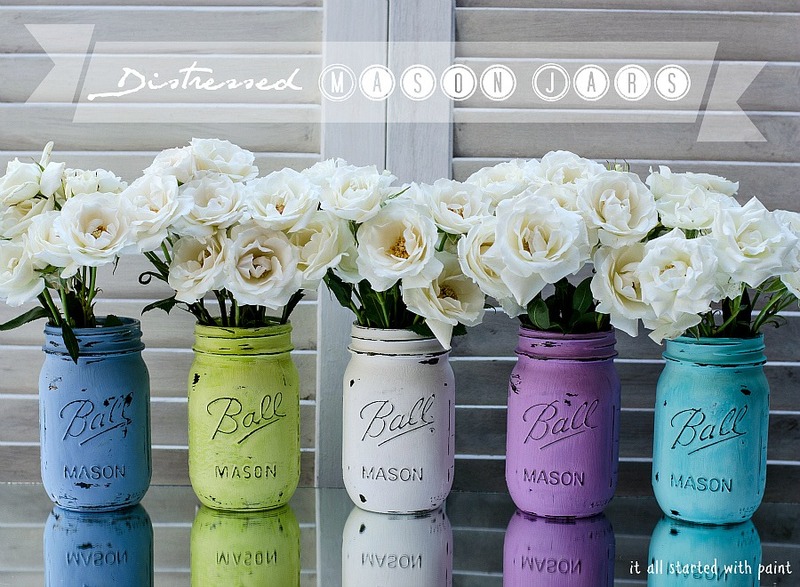 I love these mason jars! How cute! Umm… I would buy them, they are gorgeous! Love the colors. My Dad had a saying when people would look at something handmade and say “I can make that.” and he’d say, “Yes, but will you?” So, put them on etsy and let me know, I’d like a set! I love these! I think you could sell them, just like the others have said some don’t like to paint but appreciate those that do! What colors did you use? They would look amazing in my kitchen! Why not? What have you got to lose? Like some other people said, some of us could make them ourselves, but others can’t or don’t want to take the time to do so. I think they’re beautiful – go for it! Try it, it just might do pretty well. There are weddings coming up don’t forget. 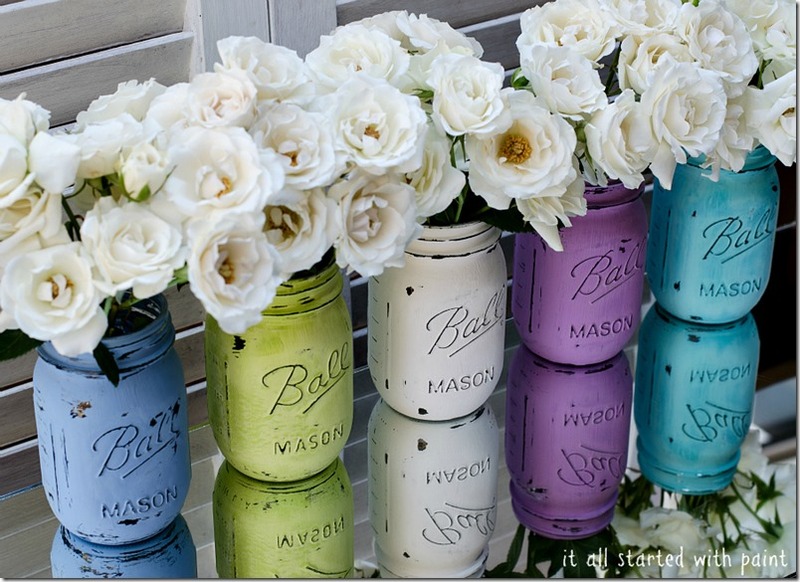 The style of mason jars won’t last too much longer after summer I am thinking.. Good luck! I love your jars and have been wanting to paint one myself. I think that you should go for it. Everybody will love them, but not everyone will want to make their own which leaves you to do the making. So pretty! I say you should try to sell them. For me personally, when I see stuff like this that seems easy on etsy, I try to do it myself. BUT, then there are people, like my sister, who hate doing anything crafty and she would totally pay $24 to not do it herself! These turned out really beautiful! So fresh and pretty! I have no idea but you don’t lose much by trying! See what happens! Okay,so I’m curious on what product you found that is water resistant and scratch resistant enamel? I’ve just starting painting glass (not mason jars-yet) and would love to know what to put over the paint! 🙂 YOur jars are beautiful! Hi, I was wondering where to find scratch/water resistant enamel?! These are beautiful! 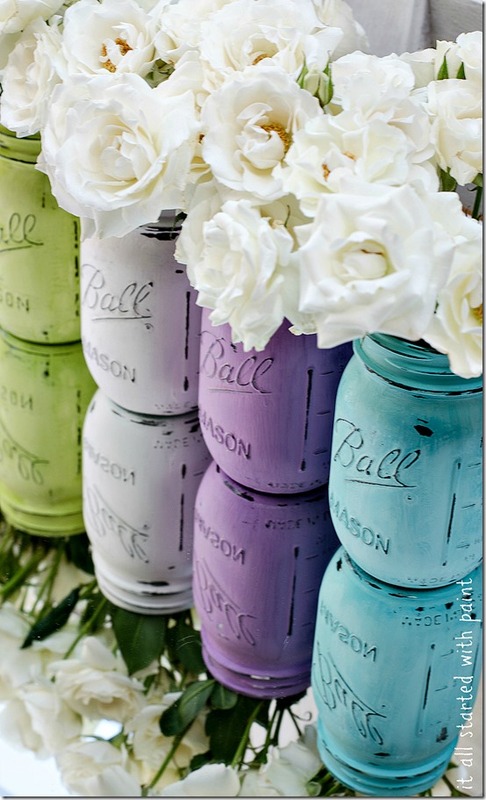 Anything with mason jars I love!! You should absolutely sell them! They might be easy to make but just because people have the ability to make them doesn’t mean that they will. I would make them because I like crafts. BUT there are people that like to look and buy rather than try. Go for it! Yup, I say make 2-3 sets as shown in this post and offer them in your shop. I am a crafty person, but I would still give serious consideration to buying these from you. The deciding factors for me would be: 1) Are those flowers included so that when I unpack my box my purchased project would be completed? and 2) Is the cost of shipping going to be a deal-killer? I’m having a hard time trying to imagine how you would set a price for shipping when obviously there would be quite a bit of your personal time involved, packing materials to be purchased, and then the actual cost of shipping at the PO, FEDEx, or whereever. Good Luck. They really are pretty, and I CAN see busy women ordering them. You could so easily sell these! 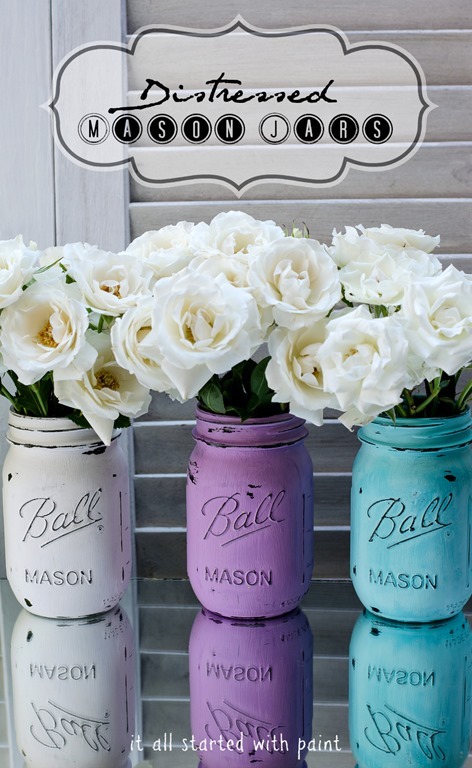 They are beautiful and jars like this are very popular and timeless. I also think $24 for 4 is a steal! They are totally adorable; but, no, I wouldn’t buy them from you! We are a very DIY team around here, and I’ve never purchased anything from Etsy. But…….I do know there are plenty of people out there who either have no inclination to do this type thing, or no space/place to do crafts, or no time, so I would think you would for sure have some buyers. They are adorable…never know till you try! I think these are beautiful. If you could sell them inexpensively enough, they would likely sell, I think. There are a lot of people who just aren’t crafty themselves who would love something like this! LOVE these!! !…sell them, gift them etc!! !…they are lovely…thx for sharing…going back to look around some more….I feel the need to copy this one! !…I’m a mason jar junkie!! Lovely!! I pinned to my “crafty inspirations” board!! I love the muted look. I personally am terrified to really change dramatically any of my vintage pieces, but mason jars are really easily found so it gives me hope to change my attitude! For sure put them in your shop…some people just aren’t crafty or have the time or have money to burn. Love what you did here…so fresh for spring. I sell on Etsy and sometimes I am surprised at the things people will buy. The picture of your item will sell it. And remember this, sometimes people can make it, but they don’t want to take the time or they don’t have the time, but they love the item and just want to buy the item. So go get ’em girl. I think you will be surprised at how well these will sell. I think they are adorable! I actually just spray painted some old jars (no distressing) and thought how easy to make something unique and colorful. It’s always worth trying to sell something, so why not? I think for sure there are people that would be willing to pay for them! They’re beautiful. It’s a great idea what you’ve done and they have a very great look! Thanks for sharing! I would buy them! Because you have several colors, several jars, etc,. and it would cost me MORE to buy the supplies than to purchase them. Keep in mind the gas to find the place to get this stuff, the cost of the supplies, the aggravation of trying to do it as well as you do and the time expended in wasted energy because I would just throw it all away and then look for a reasonable online source to purchase them. I mean isn’t that the whole purpose for me following your blogs? 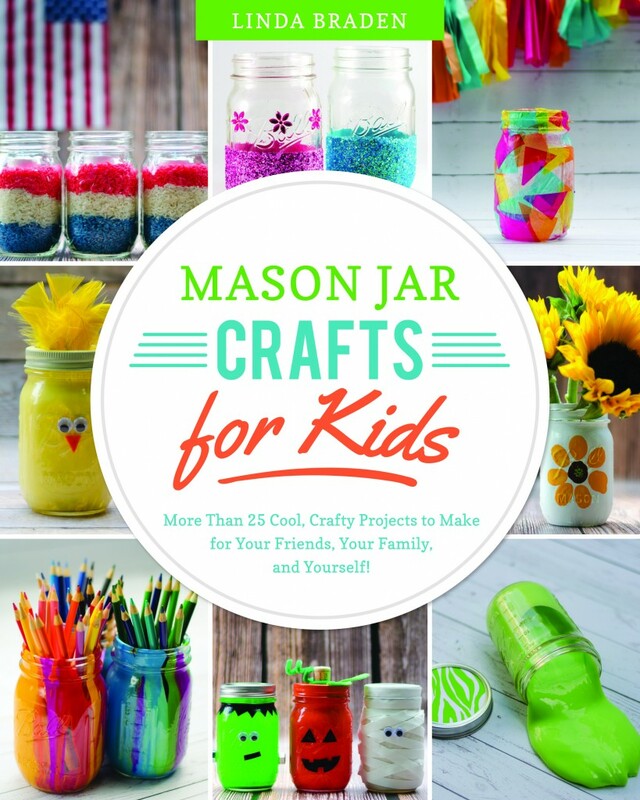 I think that the jars are great and will be fun to try. Thank you for the post. 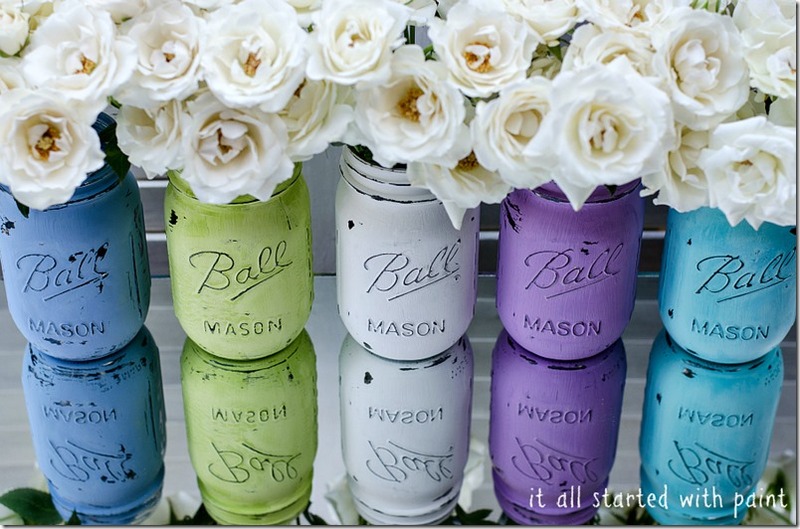 Wow Linda – I am such a sucker for painted glass jars – I have loads – all painted on the inside. But now you are gonna set me off on a whole new painting spree!!! Seriously – these are gorgeous. Definitely put them in your Etsy store! PS – pinning the heck outta them! There are absolutely beautiful! I sent you an email and hope it’s alright that I mentioned your post and linked to you on my blog! They are beautiful! And now I’m going to make some for my craftroom. But your followers probably aren’t the best folks to survey because we are all crafters & DIYers. We go to dept stores & see art, pillows, tables, chairs, comforters…And look at the price tag, yelp…and then say “I can MAKE that myself!” Then we do just that. But I’ve found that non-crafty folks gasp in amazement after I’ve done it and no matter how simple I say it was, they won’t even attempt it. Some have no confidence; others, no desire to do it. We can’t imagine paying for something so easy to do yourself, and at a fraction of the cost. But that’s probably who your customers would be. I say GO FOR IT! Not only do I think you should try selling your painted jars but you should also considering selling your photographs of your painted jars 😉 I think your suggest price is reasonable also. I think people would buy them.They are cute! I think they’re gorgeous! And I love the colors you picked! If I’m being honest….I would tag the pic and save it in my file of things to do and try and probably never get around to it, but still love the look of yours. I do that with everything. If I saw you at a craft show, I would buy them on the spot. Very pretty! I would list them and see what happens, why not? What kind of acrylic paint did you use? I have been wanting to do this and the only thing I am missing is the type of paint. I definitely want a matte look. Does anyone have any suggestions? I think people would buy them, especially at 4 for $24! You’d be surprized! I sell the chalkboard labels in my etsy shop, and even though I had a lady on a blog blast my ad for being “too expensive” and did a whole story on my shop… it had the opposite effect. I actually got a lot of traffic from her blog from people reading the article, and a lot ended up buying the labels from me. I guess they weren’t that bad then huh? I think you did a beautiful job, and they’re a lovely gift. Go for it! Love them…. will make my own, but a lot of people can’t so yes, you should definitely sell them on your page. I wouldn’t buy them either but I would sell them! Shipping glass is very expensive cause it is considered very fragile, if you take it to a local mailing store they will wrap, pack and ship it for you. I wanted to let you know an old trick-of-the-trade-faux-finishing-tip: use a little vaseline (or just plain brand petroleum jelly) on the places you don’t want the paint to stick. I see many “distressed” items these days; in shops, flea markets etc. They all have the same malady: they LOOK distressed. Many self-taught crafters only use one type of tool to do their magic. Take it from me, a mostly self-taught crafter!!! I did have one class on faux finishing though…and obviously need another on over-punctuation usage. These are amazing! Where exactly is the best place to buy the acrylic paint and the final scratch free enamel? I am only seeing spray paint? Try to make them water immersible. Can’t image not being able to clean them thoroughly in warm soapy water. 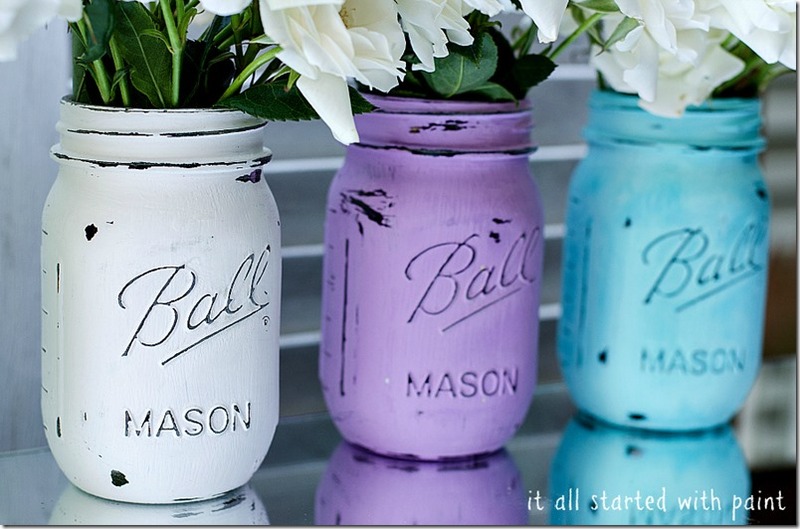 IF I DIDN’T HAVE THE MEANS OR TIME TO MAKE MY OWN PAINTED MASON JARS…I WOULD PAY $24 FOR A SET!! THEY ARE ABSOLUTELY BEAUTIFUL!! LOVE THE SHABBY LOOK!!! I think its great that you can buy painted mason jars online. Its not that most people are not crafty, most of us are busy. 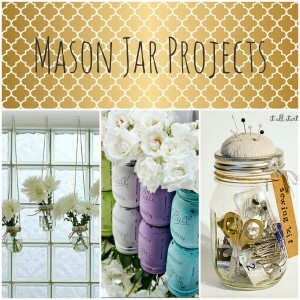 I saw so many beautiful mason jars on Etsy. I’m willing to buy one to see how it turns out. Mason jars bring a bit of vintage or natural vibe to anywhere you put it. for me I need to decorate my desk. I wouldn’t buy them. It’s not hard to paint a jar and you can buy a case of mason jars for $10. You did a beautiful job though. Too true, Brenna. But you’d be surprise at how many people do buy them. I’ve listed them at the Etsy shop and have been doing a lively business with them! Are there other Mason Jars besides those that have Balls written on it? Absolutely! There are Kerr jars too. And you can also find jars with absolutely no writing on them at the craft stores. These are great! I want to make some for my grandmother’s 85th birthday I am planning. Her name is Rose and it’s going to be a vintage theme with lots of roses, (because of her name, get it? lol), burlap and lace. So anyways what I was wondering is what did you use for the top coat (enamel)? Yes, I used a spray enamel coat on top. In a matte finishe. You can find it at craft stores. Mine didn’t work!! Could it possibly be the type of food coloring I used.??? That was the only different thing I used ….otherwise I followed your instructions exactly.!!! What do u think …could it be that your food coloring was thicker ? Mine was the little plastic bottles …4 colors in 1 box type. Perfect for party decor! Amazing DIY! Linda, the jars are beautiful and I’m sure people will buy them. Your price is very reasonable. I am a crafty person, and would make them, but a lot of people would rather buy them, they are too busy, or not crafty. Love the flowers you used too how do you get them to stand up in there. Just by using three or four of them? Yes, by using enough to fill the space. I also cut the stems down too. Oh, and use flowers with sturdy stems.